I decorate! 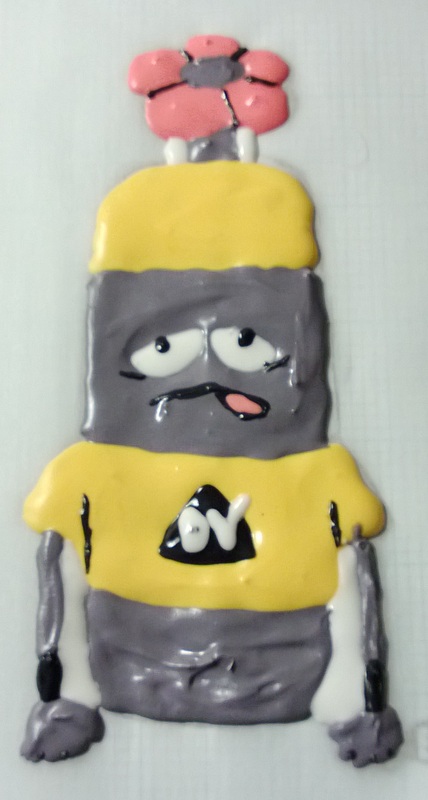 Duncan cake edition | Random moosages as I see fit. I just did something really ridiculous. Even for me. That’s saying something. I mean, I think I have a very refined taste in ridiculous. This was…very ridiculous. So, what did I do? I just decorated a cake. In my hotel room. Somewhat on a whim. With a technique I’ve never used before. With no preparation beforehand. You might wonder why I would have done something like this. Well, it’s because Mr. Arachnid is leaving today. For good. It’s his last day on the project. And yesterday, for some reason, I decided to look up images of Duncan. Perhaps you have no idea who Duncan is. I cannot blame you. I did not know of Duncan’s existence until I was assigned to this project. 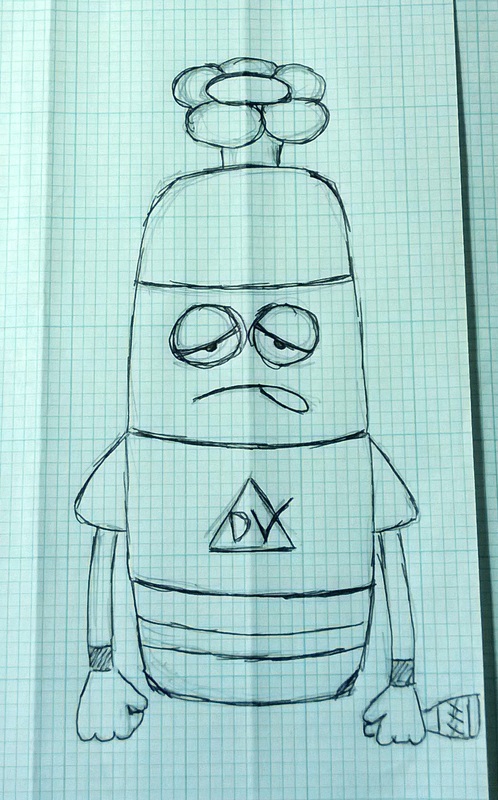 Duncan is a valve with eyes and arms and is the mascot, of sorts, of Emerson’s DeltaV, their distributed control system. I have grown to quite dislike Duncan. I see Duncan as the personification (valvification?) of DeltaV, a control system I very much dislike. All of it is just…dumb. But you cannot speak ill of Duncan, especially when he’s verifying your programming. It’s bad luck. Duncan will more than likely throw you an error. Or several errors. They may even be severe errors. But he will not tell you what they are. And then he will shut everything down and not save anything that you have done. Duncan is kind of a jerk. We all think this. Now then, Mr. Arachnid and I have a fairly similar sense of humor. When we were talking earlier in the week, we both somehow settled on Duncan being a type of Pokémon, we haven’t figured out what type, but he evolves from valve to actuator to controller. And he always looks like he’s in the midst of a severe hangover. And so I drew this hungover Duncan. And then I somehow found that there are Duncan cakes. 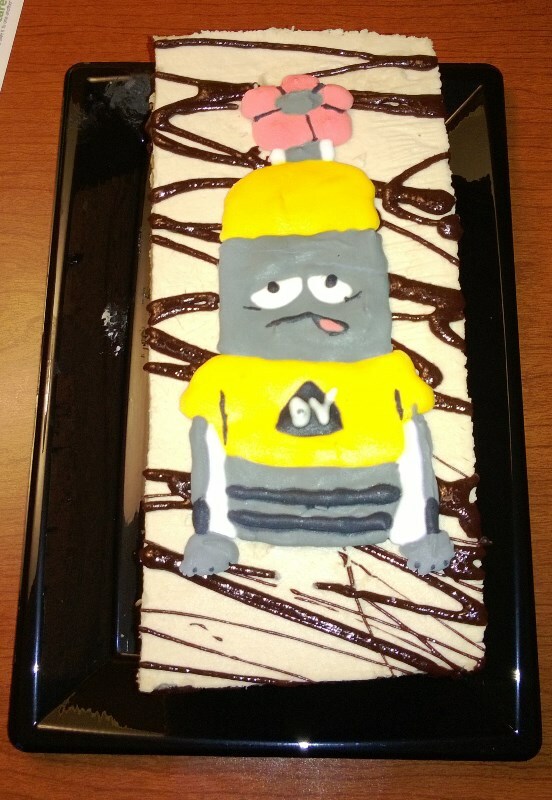 And then I decided I HAVE to get one of these cakes to properly send Mr. Arachnid back home. Of course, he’s leaving today and I had the idea only yesterday and bakeries generally require 48hr notice for custom designs even if it’s just decorating and not a custom cake and so I have to do this myself but I am in a hotel and not even a suite this time so I have no counter space at all nor do I have any kitchen appliances with me nor do I normally decorate cakes because I much prefer making the cake over decorating it but Mr. Arachnid absolutely needs a Duncan cake. So what do? Store bought cake and royal icing. The cake I saw used buttercream, or something similar to frost. But the cake itself was Duncan shaped and I didn’t have the luxury to make a Duncan shaped cake. Also, I didn’t really like the spikiness of the frosting. This photo was from a graduating DeltaV class or something. Links to source. I wanted something smoother and I didn’t want to make buttercream frosting. Then, I remembered how they’ll often decorate cookies with royal icing. People will use a thicker royal icing to outline a shape and then use a thinner royal icing to flood fill the outline. I figured I could make a shape on parchment paper and then transfer it onto the cake after it had dried. Also, royal icing is white, so it’s easy to dye different colors. I had no previous experience with royal icing, but I wasn’t going to let that stop me. Having read this post on decorating with royal icing, I embarked on my plan to make a Duncan cake. I quickly sketched out a hungover Duncan. and got to work making the icing. I made the icing entirely by hand. 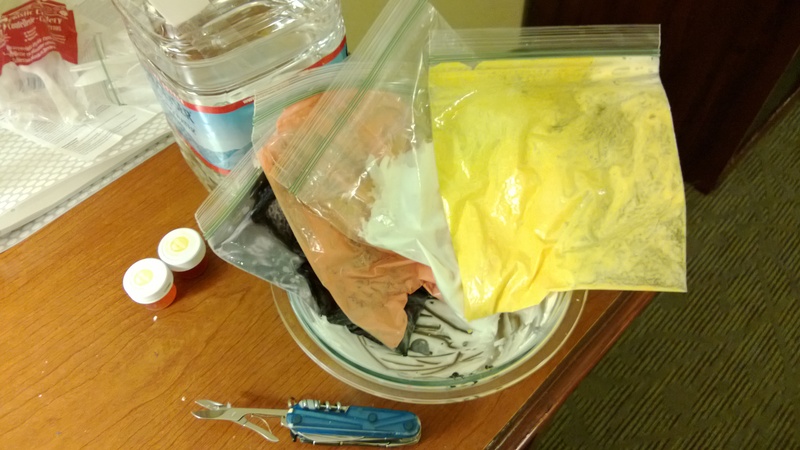 I bought a small mixing bowl, a really dumb whisk, meringue powder, powdered sugar, and gel food coloring and made a half batch of icing and dyed it all the colors I needed. I travel with plasticware, small plates/bowls, and ziploc bags so that helped. I also normally buy a gallon of drinking water the first day, so I had that on hand too. My arms are surprisingly not sore from beating icing. Here’s my attempt at hungover Duncan. I forgot to put the two black stripes on until after I took the photo. I also got rid of the beer or whatever bottle because it was more work than I wanted to put in for that bit of brown. So now, Duncan just looks sick for no reason. I don’t mind. Duncan should be sick. He deserves it. Icing Duncan got to dry overnight by the AC and I stuck him on the cake in the morning. Tada! Royal icing, once it dries, is pretty brittle. I, unfortunately, cracked his head in transport. Duncan has a splitting headache. One of the most ridiculous things I have ever done. Oh, and the cake is an Artisan Tiramisu Cake from Vons that I smoothed out a little, mostly by picking off the whipped cream florets. A ridiculous cake for a ridiculous exercise.